6 tips on how to install a child seat with a seat belt. 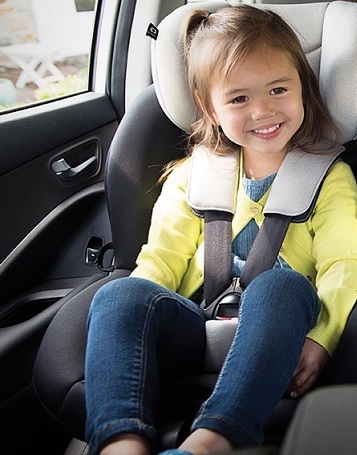 The Irish Road Safety Authority reported that 3 out of 4 child seats are incorrectly installed. We work with car rental companies at Dublin airport and we’ve seen enough incorrect seat belt configurations to agree. Most parents tend to have their child seat professionally installed, so often haven’t had a chance to install one themselves. The good news is, once you know how, it’s really not difficult. Here are 6 tips to bear in mind, but always follow the manufacturer’s instructions. To ensure you install the car seat correctly, look for the visible, often colour coded, seat belt guides to help you. Have a look at the back or side panel of the car seat for an installation sticker. Seat belts follow the same path as when an an adult uses it. There are two belts; the diagonal or ‘shoulder’ strap runs diagonally from shoulder to buckle. The second belt, or ‘waist strap’, runs horizontally across your hips. When you are installing high back boosters and forward facing child seats, follow this diagonal / horizontal rule. The most common mistake we’ve seen is where the shoulder strap has been threaded through both shoulder guides. This is incorrect. The diagonal belt starts at the shoulder feed and crosses diagonally down to the opposite side. Remember it will click in to the buckle on the opposite side to the clamped shoulder feed. With booster seats, always ensure you position the belt correctly when your child is actually in the seat. The belt must feed through the plastic shoulder guide on the car seat, to protect your child’s neck. The waist strap should sit high on their hip bones rather than lower down across their abdomen. If you are installing a baby seat with a seatbelt, remember to position the car seat facing rearward. If the seat looks like it might tip the baby up, use a rolled-up towel under the child seat to position it at a more level position. To install a baby seat, the shoulder strap threads through a belt guide at the back of the baby seat. The waist strap then feeds across two belt guides at the front. It also helps if you press the car seat down into the seat of the car and pull off any slack in the seatbelt. Unfortunately, when you hire a car you will nearly always have to install the seat yourself and 99.9% of the time, the car seat won’t have isofix. For more information on car rental companies and baby seats, click here.
. Follow these steps and make sure the seat doesn’t move around if you wiggle it and you should be fine. Packing for a Family Holiday?